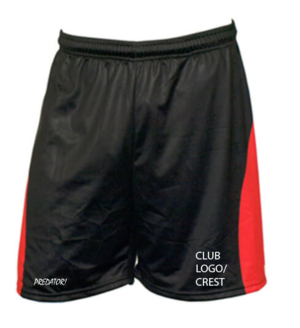 Predator customised ADULTS Qwick-Dri™ rugby shorts can be printed with anything you desire for the inclusive price of £12.95 + VAT per pair. (You will need to supply good quality artwork of required badges / logos etc). Minimum order = 20 pairs of shorts. Qwick-Dri™ shorts cannot be ordered on line. Please call on :- 01769 573706 to discuss your size, embroidery & printing requirements.